Sites like Daily Kos and Firedoglake have, on first glance, an impressive number of comments, suggesting that their correspondents are reaching The People. But when you actually read thru some of those threads, the majority are single-sentence Dem dittoheads who occasionally burst into flame should anyone show up to disagree with their host's sentiments, or worse, diss the Holy Clintons. These sites, and others like them across the spectrum, serve as echo chambers for those who need daily ideological reinforcement and related comforts of the hive mind. And this makes those sites absolute bores to read, since each post's conclusion is known before the opening sentence is finished. If that's what it takes to attract more than 50 readers, then come forward and fill up the front rows, 'cause I ain't gonna shout to the cheap seats. For those curious, my weekly numbers, which double whenever I appear at Counterpunch or This Modern World (and nearly tripled during Israel's assault on Lebanon), are roughly the same as Partisan Review's monthly circulation circa 1938, when the likes of James Agee, Dwight MacDonald, Mary McCarthy, Paul Goodman and Clement Greenberg published there. That's a readership I can definitely live with. Any audience is a good audience. Indeed, expressing yourself to a small, interested group of people is far more worthwhile than shouting party-line clichés and platitudes to an anonymous mass. There's a related point that can be made about audience size. A blog like Daily Kos, which endlessly recycles breaking news stories, adding only a little feeble political spin and a few barbs at opponents, may enjoy a large daily readership, but little of its content will remain interesting in a week's time. By contrast, more dense, difficult, and politically challenging writing like the sort that Perrin's heroes in the early Partisan Review produced may still be worth reading decades into the future, even if it never enjoys a massive audience. A novelist like Mary McCarthy may never knock the publishing sensation of the moment - Wilbur Smith or Stephen King or JK Rowling - off the top of the bestseller list, but she may in time outsell them all, because her work has a far longer shelf life. People will be reading her novel The Group when those endless Harry Potter novels are being thrown out by municipal libraries. People of every country will still be reading Marx's Capital when Anthony Giddens' The Third Way has become a curiousity of intellectual history. "How many people can look at the Mona Lisa? You ever been there? I mean, maybe, like, three people can see it at once. And yet, how long has that painting been around? More people have seen that painting than have ever listened to, let's name somebody -- I don't want to say Alicia Keys -- say, Michael Jackson. More people have ever seen the Mona Lisa than ever listened to Michael Jackson. And only three people can see it at once. Talk about impact." The blog post may one day be seen as a unique literary form, positioned somewhere between the essay and the old-fashioned art of the epistle. I don't think it's absurd to think that some of the best work being done by bloggers today can have a shelf-life longer than Harry Potter - certainly, I've got a file on my hard drive full of blog posts that managed to amuse, enlighten and challenge me, all in a space smaller than most essays demand. Part of the appeal of blogging is the spontaneity and levity that the form can have, so I'm certainly not suggesting that bloggers should be sitting grimly in front of the keyboard trying to turn out masterpieces. My favourite blogs mix up serious writing with jokes and off-the-cuff rants, and I wouldn't want that to change. But I think that writers like Marc Cooper who insist on judging a blogger's worth by the number of visitors he or she attracts in a day are as shallow as the folks who hail JK Rowling as a great prose stylist just because she empties the shelves at Whitcoulls. It'd be fair to say that golf has never been a sport of the masses - big green fees and expensive equipment mean that in most parts of the world it is the preserve of wealthy elites, and in densely populated countries golf courses are often resented for the exorbitant amounts of land all those fairways and bunkers and greens take up. There's a scene in the 1992 flick Falling Down in which stressed-out ordinary bloke Michael Douglas loses the plot and shoots out the tyres of a golf buggy, giving its owner a heart attack. 'Now you'll have to die in those silly golfer's clothes', Douglas observes matter of factly, before turning and ambling away down the nearest fairway. Movie audiences in Bel Air and Surrey gasped in horror; in Jakarta and Manila they applauded wildly. During the half-finished revolution that ousted Suharto in 1998, Indonesian peasants occupied a number of golf courses in densely populated parts of Java and Sumatra, ploughing up fairways and greens and planting them with rice and other crops. Now the people of the barrios of the Venezuelan capital Caracas have that city's golfers in their sights. A petition and protests have prompted the city's mayor to announce the seizure of three golf courses, including the Caracas Country Club, which was established in 1918 and is used by foreign diplomats and some of Venezuela's wealthiest citizens. The precious land that has been the preserve of a handful of golfers will be used to build low-cost apartments for up to 70,000 people in an effort to deal with Caracas' severe housing shortage. Venezuela's elite has reacted with anger to the announcement, and their objections have been relayed by some of the more 'moderate' members of Hugo Chavez's government, including vice President and Communist Party leader Jose Vicente Rangel, who is worried about 'antagonising' Venezuela's capitalist elite. With Chavez out of the country when the expropriations were announced, Rangel made an effort to distance the central government from the decision, but central government has no legal power to reverse Mayor Juan Barreto's decision. Peter Larsen links the dispute between Rangel and Barreto to wider policy debates within the Bolivarian movement, and finds traces of these debates in Hugo Chavez's recent speech to the United Nations. I have to own up to being an ex-golfer - I grew up in a rural area where the sport is quite popular and accessible, my Mum played (and still plays) at a fairly inexpensive and unpretentious club nestled between dairy farms near Pukekohe, and when I was twelve I enjoyed hunting for lost balls in the bush and scrub along the fringes of fairways. (Hey, I've always been easily amused, which probably explains this blog...) These days though I'm inclined to agree with Maurice Gee, who explained his decision to give up the game by reflecting that 'It's just not healthy devoting so much mental energy and physical effort to getting a small ball into a hole three hundred feet away'. But even if I thought golf was the most thrilling pursuit in the world, and followed the exploits of Tiger Woods the same way I followed the exploits of Richard Hadlee in the '80s, I'd like to think I'd be able to appreciate the arguments Barretto and his supporters in the barrios of Caracas have made against the game. It is anti-social, to say the least, to make hundreds of acres of precious land in the middle of an atrociously crowded city the preserve of a tiny number of people. Auckland may not suffer from the same overcrowding as Caracas, but a strong argument could still be made for the expropriation of the numerous golf courses in this fair city. Take a look at a map of the place, and you'll see that at least a third of the 'green spaces' in the city are not parks or school playing fields, but golf courses. With their mature trees and open spaces, courses like the ones in Remuera, Mt Roskill and Devonport would make public parks to rival the Domain or Cornwall Park. Why should these spaces not be made available to the whole population? The erstwhile golfers would whinge and moan, but they could always develop a passion for frisbee or touch rugby. And there's even a precedent for the reclaiming of golf course land in New Zealand, in the form of the epic protests that eventually won the Raglan course back for Tainui Maori in the early '80s. I AM TIMOTHY OTIS, THE DIRECTOR IN CHARGE OF AUDITING AND ACCOUNTING SECTION OF BANK OF AFRICA(BOA) BURKINA FASO IN WEST AFRICA WITH DUE RESPECT AND REGARDS. I HAVE DECIDED TO CONTACT YOU ON A BUSINESS TRANSACTION THAT WILL BE VERY BENEFICIAL TO BOTH OF US AT THE END OF THE TRANSACTION. ENABLE THE WHOLE PLANS AND IDEA BE PROFITABLE AND SUCCESSFUL DURING THE TIME OF EXECUTION. THE SAID AMOUNT WAS U.S $14.5M (FOURTEEN MILLION FIVE HUNDRED THOUSAND UNITED STATES DOLLARS). AS IT MAY INTEREST YOU TO KNOW, I GOT YOUR IMPRESSIVE INFORMATION THROUGH THE BURKINA FASO CHAMBER OF COMMERCE ON FOREIGN BUSINESS RELATIONS HERE IN BURKINA FASO. THIS IS THE ACTUAL REASON WHY IT WILL REQUIRE A SECOND PARTY OR FELLOW WHO WILL FORWARD CLAIMS AS THE NEXT OF KIN WITH AFFIDAVIT OF TRUST OF OATH TO THE BANK AND ALSO PRESENT A FOREIGN ACCOUNT WHERE HE WILL NEED THE MONEY TO BE RE-TRANSFERRED INTO ON HIS REQUEST AS IT MAY BE AFTER DUE VERIFICATION AND CLARIFICATION BY THE CORRESPONDENT BRANCH OF THE BANK WHERE THE WHOLE MONEY WILL BE REMITTED FROM TO YOUR OWNDESIGNATION BANK ACCOUNT. INTEND TO RETIRE FROM SERVICE AFTER WE CONCLUDE THIS DEAL WITH YOU. 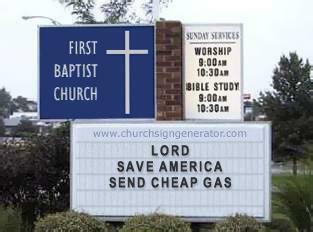 If you haven't seen this particular message, I'm sure you've seen many that bear more than a passing resemblance to it. And I suspect that, for many people in the West, at least, the name 'Burkina Faso' is associated only with transparently dodgy e mails promising quick riches in return for an even quicker cash donation. It's true that dodgy e mails come from other places - I've had more than a few from Nigeria - but Burkina Faso seems to be the home of most of the clumsier attempts at fraud-via-e mail. Thomas Sankara's coup created that rare flower, a left-wing military government. During their short time in power, Sankara and his allies attempted to implement a number of radical, if not revolutionary measures to reorganise their society. They initiated a programme of land reform, nationalised some of the country's paltry industrial sector, passed laws that gave equal rights to women and lower castes, and tried to mobilise the population of an overwhelmingly rural, peasant society by creating grassroots revolutionary committees that could become alternatives to the old power structures of tribe and caste. The Sankara government also tried to instil a new pride in its people, and the name Burkina Faso must be understood in this context. At the same time as he undertook all these progressive measures, Sankara held back from directly challenging foreign capital and the international financial agencies that dominated his country's desperately weak economy. In October 1987 Sankara was killed in a bloody coup backed by international capital, conservative tribal leaders, and Burkina Faso's small but influential business class. Burkina Faso deserves to be known for something more than dodgy e mails. You can read more about Thomas Sankara and his revolution here. During my undistinguished and soon-to-end reign as editor of the literary journal brief I've used a pretty simple tactic to deal with the nuisance that is snail mail. I throw any letters and packages I receive into a large box, wait until people start nagging me - by phone, or e mail, or at the pub - to produce an issue or pay outstanding bills, then empty the box on my bedroom floor and pick through the resultant rubble for usable submissions and cashable cheques. Enclosed are a few literary/botanical tricks and puzzles. You asked me to send you some new work and here it is. I hope it pleases. The recent coup in Thailand seems to have been greeted by a collective shrugging of the shoulders here in New Zealand. Experts wheeled out by the media have told us that the coup is at least 'understandable', if not quite laudable, because the Prime Minister it desposed was unpopular, and because 'Thailand has a history of interventions by the military'. The way the pointyheads tell it, the moving of tanks around Bangkok and the sudden sound of martial music on every radio station is a sort of jolly Thai cultural practice, their version of Morris dancing or our haka. Thailand: Back to the dark ages? On the evening of 19th September a military junta calling itself “The reform committee in the democratic system with a monarchy as head of state” staged a coup and overthrew the democratically elected, but controversial, Prime Minister Taksin Shinawat. The official name of the junta, which must be read out in full every single time it is referred to by the media, reminds us of George Orwell’s 1984. “Democracy” now means military dictatorship and “reform” means tearing up the 1997 constitution, abolishing parliament, independent bodies and declaring martial law. Taksin’s picture is banned from the TV and when it is shown by the BBC World Service, mysterious advertisements suddenly appear on screen. Taksin Shinawat, a mobile phone and media tycoon, founded the Thai Rak Thai party after the economic crisis of 1997. The party was unique in recent Thai politics in that it actually spent considerable time developing policies. They held meetings with different social groups and came up with real policies at the time of their first election victory in 2001. Thai Rak Thai was a “populist” party which offered pro-poor policies and village level Keynesian economic stimuli by pumping state money into local projects. At the same time this party of big business also pursued neo-liberal policies such as privatization and the support for free trade agreements (F.T.A.s). The poor, who form the vast majority of the Thai electorate, voted enthusiastically for the two flagship policies of the party. These were a universal health care scheme (the first ever in Thailand) and a 1 million baht fund loaned to each village to encourage small businesses. Thai Rak Thai won a second term of office with an overall majority in parliament in 2005. It is easy to see why. The main opposition party, the Democrats, spent the whole four years attacking the health care system and other social benefits. They said that it contravened “fiscal discipline” and created a “climate of dependency”. Previously the Democrat government, which came to power immediately after the economic crisis, had used taxes paid by the poor to prop up the financial system. The banks were in crisis due to wild speculation by the rich. The Democrats have supported the coup. There was a darker side to the Taksin government. During their first term of office they waged a so-called “war on drugs” in which over 3000 people were shot without ever coming to trial. In the three southern-most provinces they waged a campaign of violence against the Muslim Malay-speaking population. Ninety young men who had attended a peaceful demonstration were deliberately murdered at Takbai by tying their hands behind their backs and piling them into army trucks, one on top of the other. After many hours of transportation they were dead on arrival at an army camp. The government was also responsible for the murder, by the police, of defence lawyer Somchai Nilapaichit, who was defending people from the south. In addition to this Taksin and his cronies avoided paying tax. Together they netted 70 billion baht from the sale of their mobile phone company and did not pay a single baht in tax. The government was also just as corrupt as many previous governments. The Peoples Movement has not been dormant. The largest movement mounted by the working class against the Taksin government was the action against electricity privatization by 200,000 workers in 2004. It has helped to delay privatization plans. Despite protests against the government’s human rights abuses, privatization and another huge rally against F.T.A. policies by people in the social movements, the government retained strong support among the poor because there is no credible Left party that can mount a challenge. The right-wing mainstream parties have no appeal to the poor. Towards the end of last year a large protest movement against the government arose. But it was a Right-wing movement lead by rival media tycoon Sondhi Limthongkul (not to be confused with General Sondhi who is now the junta head). It criticized government corruption and called for “power to be returned to the King”, urging the King to appoint a new government. Unfortunately, the more conservative sections of the Peoples Movement decided to joint this protest movement, creating the “Peoples Alliance for Democracy” (P.A.D.). They saw Sondhi’s protests as a way to oust Taksin because they believed that the Peoples Movement was too weak to act independently. They joined this cross-class alliance without any pre-conditions. Thus corruption remained the main criticism of the government. while human rights abuses, the South and neo-liberalism were largely ignored. The protesters also wore yellow “Royal” shirts. Many progressive sections of the Peoples movement were very unhappy about this position and refused to take part. The problem is that the Peoples Movement would be stronger if it were not so dominated by single-issuism, autonomism and N.G.O. ‘third-way” politics. There is a refusal to build a political party of the movement, which is a serious weakness. Taksin dissolved parliament and called an election in April 2006. The election was boycotted by the opposition and became a referendum on the government. In the event, 16 million people voted for Thai Rak Thai and 10 million voted abstention. There is a fundamental political argument at the centre of the current political crisis. On the Right, and this includes some in the Peoples Movement and many so-called progressive academics, they believe that Taksin cheated in the election, mainly by “tricking the ignorant rural poor”. This is a convenient justification for ignoring the wishes of 16 million people. Together with earlier calls for the King to appoint a new government, this position leads to one which supports the military coup. On the Left, we believe that the poor had good reasons to vote for Thai Rak Thai, given that there were no better alternatives on offer. We have always opposed Taksin, especially for his human rights abuses, but a military coup, tearing up the Constitution and trampling on basic democratic rights is not the answer. The answer is to build an alternative party which campaigns for a welfare state, progressive taxation and opposition to neo-liberalism. The Southern problem should be solved through peaceful political means, including the right to self-determination by the local population. However, in the immediate future, there is a pressing need for the defence of democracy. 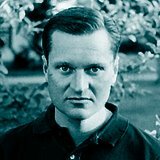 With sixty-two votes to John Ashbery's sixty-one, Tomas Transtromer has won this blog's 'Greatest Living Writer' poll by the skin of his teeth. 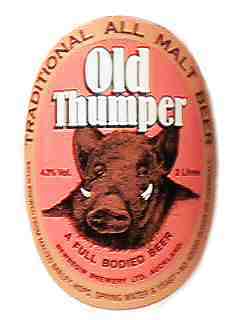 A bottle of Old Thumper will be going in the mail to Stockholm as soon as I have the dosh. Don't hold yer breath, Tomas. After taking an early lead, our own Jack Ross finished with a disappointing seventeen votes, possibly as a result of the discovery of a naughty portrait of Auckland's most esteemed literary festival which he published very quietly several years ago. Despite his Nobel last year, Harold Pinter only took the bronze, but he will be cheered to see that two of his more obscure plays are being performed in Auckland at the moment. Orhan Pamuk struggled to get past Jack, let alone Tomas, but he has worse things to fret about. Stephen King came in last with a mere three votes, which cheered me immensely. Yesterday the BBC reminded us of the 51st anniversary of the invasion and annexation of Rockall, one of the less disastrous predations of the British Empire. I bet the Brit soldiers getting picked off in Helmland would have preferred a role in the liberation of Rockall...hold on, what's this? Doesn't it show those damn blasted Islamists flying their green flag over another piece of the Empire? Comrade Chavez has certainly stirred up a hornet's nest with his latest speech to the United Nations, the text of which you can read in translation here, at the site of Kiwi blogger Connectivity. Noam Chomsky won't be complaining about big Hugo's performance - his book Hegemony and Survival has shot up the bestseller lists - it's at number 4 on Amazon, and rising - after the Venezuelan President gave it a plug. It is possible to make various criticisms of Chavez's speech, and of his politics in general, but who can deny the enormous educational value of his words, for millions of ordinary people struggling to find an explanation for the actions of the Bush regime? Chavez's understanding of imperialism may be somewhat deficient, and his own practice as President may be inconsistently anti-imperialist, but he has undeniably made a big contribution to reintroducing the word - or, rather, the concept - of imperialism into political discourse. For that he deserves our thanks. The most outrageous response to Chavez's speech came from John Bolton, Bush's rep at the UN, who said that it was "too bad the people of Venezuela don't have free speech." Bolton's statement makes no sense even by the standards of the hypocritical bourgeois democracies of the West, which grant their citizens the right to free speech but deny them the means to use it effectvely by protecting the capitalists who own the mass media. Venezuela's right-wing opposition enjoys complete freedom of speech, even when it exercises this freedom of speech to incite murder and mayhem. One could justifiably complain that Chavez's government has let its supporters down by not intervening against the TV stations, 'news' websites and newspapers that call for the murder of peasant leaders involved in land occupations, claim that Cuban doctors have come to Venezuela to infect children with Aids, and beg George Bush to invade the country. To its credit, though, the Chavez government has made progress in giving real freedom of speech to ordinary Venezuelans, by investing massively in community-controlled media and beginning the process of building a new, revolutionary state which operates from the bottom up, not the top down. The job is far from over, though, if Chavez wants to turn the rhetoric of his UN speech into reality. Earlier this week I posted a reply to Tony Judt's attack on EP Thompson in the New York Review of Books. Now, over at the Aussie group blog Leftwrites, Gary Pearce is considering another recent piece by Tony Judt. Judt seems nostalgic for some kind of universal liberalism from times past that tried to transcend sectional interest. He would do well to place the reality of this under a bit more scrutiny. He seems unable to recognise the very close association within actually existing US liberalism between their admirably universalist view of the world — belief in equality, democracy, freedom and so on — and the more particularist pursuit of nationalist or imperialist interest, mainly constructed around America's special role in the world. I would go further than this. I don’t think it’s a case of folks like Paul Berman or Christopher Hitchens having worthy ends (democracy, equality) in mind and choosing the wrong means (US hyperpower) to achieve those ends. The ends of Western liberals and social democrats are themselves infected by an imperiocentric worldview. Take the concept of ‘freedom’, for instance: when it is used by liberals, this is usually a generalisation of the sort of freedoms that exist in a very liberal bourgeois democracy in a time of peace and prosperity. But Western liberals forget that bourgeois democracy in the First World is predicated on the superexploitation of the Third World by the West. The space in which democracy can exist is created by the ability of the ruling classes in the West to bribe wider sections of the population with a range of goodies - a welfare state, certain controls on the labour market and the movement of capital, a good standard of living for at least a section of the working class - and this bribery comes directly or indirectly from the pillage of the Third World. You can’t have a Sweden without scores of Swazilands or Senegals. We can see the completely reactionary quality of the Western liberals’ concept of ‘freedom’ if we examine their responses to social revolutions in the Third World. Even the pre-9/11 liberal intelligentsia that Judt looks back to nostalgically showed itself ready to criticise such revolutions - in Cuba, in Vietnam, in Nicaragua, in Venezuela - because they did not achieve the sort of ‘freedom’ which one can find in an ideal bourgeois democracy. Liberals like Tony Judt can actually be more dangerous than full-blooded neo-cons because they are able to dress up the depredations of imperialism in the language of progressive politics and human rights. Witness the response to the current calls for the invasion of Sudan by George Clooney. Can anyone imagine similar talk by, say, Paul Wolfowitz or Thomas Friedman yielding such an outpouring of agreement? Clooney’s record as an opponent of the Bush administration and the invasion of Iraq makes him a far more plausible salesman for imperialism today. Karl Kautsky vs Neanderthal Man; or: away with timelines and tidy categories! On the wall of my standard three classroom at Drury School there was a poster called 'The Ascent of Man'. The poster was dominated by a painting which showed a succession of species of the homo genus walking across a piece of African savannah decorated with lions and wildebeast. Each succeeding species in the procession was taller, less hairy, and altogether more handsome than its predecessor, and each had been given a set of dates, which indicated when it first walked the earth and when it handed the baton of progress on to the next ancestor of modern humanity. 'Neanderthal man' was the penultimate figure in the procession, a no-longer-missing 'link' with dates that fitted snugly between the demise of homo heidelbergensis and the appearance of homo sapiens. Even twenty years ago, when I was busy admiring that poster, the linear and teleological model of human evolution it represented was under siege, as pesky scientists discovered more and more fossils and bones that couldn't easily be fitted into tight little categories and a tidy timeline. Today the notion that one homo genus evolved out of another in an orderly evolutionary procession is widely discredited. Neanderthals...are now recognised as one of many genetic blind alleys, stretching far back over half a million years yet surviving some 10,000 years after the arrival in northern climes of Homo sapiens from its African homeland. Natural history is full of blind alleys. Ninety-nine per cent of the species that have ever existed are now extinct, and most of them failed to bequeath successors. The notion that natural history, and especially the natural history of the homo genus, is the history of steady progress towards 'higher' and more sophisticated forms belongs to the realm of religion, not science. But it is not only natural history that has been widely imagined as teleology. For many people, including many historians, the history of human affairs is the story of an 'ascent' from 'primitive' to more 'advanced' societies. Generations of would-be Marxists have proven themselves particularly susceptible to this illusion. Karl Kautsky and other intellectual heavyweights of the Second International developed elaborate schemata that imagined human societies passing through ineluctable 'stages', on their way to a communist utopia. Tidy timelines marked with 'stages' like 'primitive communism', 'feudalism' and so on - completely abstract conceptual rubbish bins for masses of anomalous historical detail - were laid out in tomes like Kautsky's Materialist Conception of History. Members of the Second International like Britain's Henry Hyndman and Germany's Eduard Bernstein soon found themselves advancing 'socialist' justifications for European imperialism in Africa and Asia: colonisation was a necessary 'stage' that these societies had to go through, on their way down the long road to communism. Stalin rehashed the stagist arguments of the Second International when he needed to justify collaboration with Chiang Kai-Shek in China, and similarly slippery bourgeois nationalist politicians in numerous other colonial and semi-colonial countries. Today Norm Geras, Christopher Hitchens, and the other denizens of the pro-war 'left' deploy the same arguments to justify the subjugation of Iraq and Afghanistan by the United States. Even lively and thoughtful Marxist publications like the Weekly Worker sometimes find themselves playing host to unconsciously but virulently racist stagist arguments. The linear, teleological view of history was undoubtedly given a shot in the arm by the widespread misunderstanding of the new theory of evolution in the nineteenth century, but it existed long before Darwin. In The Anthropology of Marxism, his ambitious attempt to trace the roots of key Marxist and pseudo-Marxist ideas, Cedric Robinson tracks the model of history that encumbered thinkers like Kautsky back to early Christianity, and to the writings of Exiguous and St Augustine in particular. These pious men saw history as an anticipation of the second coming of Christ and the final defeat of evil. Rejecting cyclical and other non-linear models of time, they inverted the linear stories of decline from a golden era told by Greek thinkers like Hesiod and Plato and in doing so created an eschatological teleology of considerable power. The young Karl Marx could sometimes lapse into a teleological view of history. 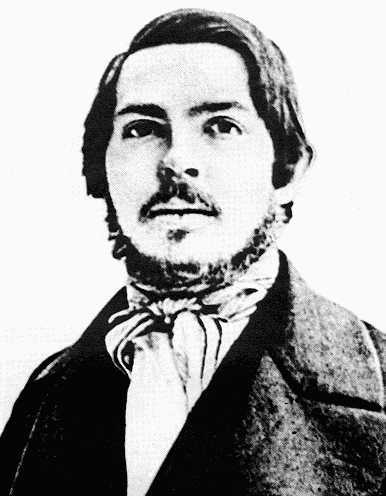 He and Engels spend the first pages of The Communist Manifesto lauding the achievements of industrial capitalism, and celebrating its violent 'dragging' of 'barbarous' nations into the realms of 'civilisation'. Such rhetoric suggests a belief that there is only one mode of progress available to human societies, and that the rest of the world must imitate the experience of the 'advanced' countries of Western Europe if it is to take the road to communism. [Marx's] conclusion that revolutionary social transformation could proceed from different directions and in different (though not incompatible) ways was a logical extension of his multi-linear view of history into the present and future. The linear, stagist view of human history is as devoid of explanatory value as the view of natural history expressed by that poster on the wall of my standard three classroom. It too deserves to die. Thirty-three years ago two old friends and allies spent a weekend together in a beautiful eighteenth century house in the English Midlands. The connection between English historian EP Thompson and Polish philosopher Leszek Kolakowski went back to 1956. The dramatic events of that year - Krushchev's denunciation of Stalin, the Soviet invasion of Hungary, and massive anti-Soviet protests in Poland - had brought both men to prominence as 'dissident' communists, critical of the Soviet Union and its satellite parties in Eastern and Western Europe. In the years after 1956, both Thompson and Kolakowski had produced streams of politically engaged writing, writing that inspired the members of what is sometimes called the 'Old New Left', that amorphous but outspoken movement of youth and intellectuals determined to find a 'Third Way' - the phrase had not yet been tarnished - between Stalinist communism and Western capitalism and imperialism. Thompson and Kolakowski had devoured each other's writing, and after an exiled Kolakowski arrived in Britain in 1968 they became acquainted in person. By 1973, when Edward and Dorothy Thompson hosted Kolakowski at their home in the rolling hills outside Worcestershire, it was apparent that the ties that went back to 1956 had loosened. After the collapse of the Old New Left in Britain and the rise of a 'New New Left' more orientated toward student politics, national liberation struggles in the Third World, and Continental Marxist theorists like Sartre and Althusser, Thompson had largely withdrawn from political activism. Despite his disappointments, though, Thompson remained a convinced socialist who identified as a Marxist and supported the working class movement confronting the Tory government of Edward Heath in the early '70s. By contrast, Kolakowski had ceased to define himself as a socialist, except in the loosest sense of the word, and had made a series of scathing attacks on the Western as well as Eastern left in right-wing publications like the CIA-funded journal Encounter. Dorothy Thompson remembers that during the conversations of that 1973 weekend the difference in the old comrades' political trajectories became unmistakable. EP Thompson was never a man to dodge an argument, and late in 1973 his 'Open Letter to Leszek Kolakowski' appeared in the Socialist Register, a yearly journal edited by two other veterans of the Old New Left, John Saville and Ralph Miliband. Running to ninety-nine pages, and studded with quotes from Wordsworth and Auden as well as Marx and Alasdair MacIntyre, Thompson's epistle was a passionate appeal against an old friend's rejection of Marxism and the socialist project. Against Kolakowski's pessimism about the prospects for Marxism and the possibility of radical social change, Thompson insisted upon the existence of a 'Marxist tradition' irreducible to the crimes of Stalin and his successors. [Y]ou keep believing that communism was in principle an excellent contrivance, somewhat spoilt in less than perfect application. I hope to have explained to you why, for many years, I have not expected anything from attempts to mend, to clean up or to correct the communist idea. Alas, poor idea. I knew it, Edward. This skull will never smile again. Thompson never replied in writing to 'My Correct Views on Everything', but at the end of 1974 the two old comrades did cross swords at a seminar held at Oxford, where Kolakoswki had become a professor. In 1978, Thompson collected his 'Open Letter' in The Poverty of Theory and Other Essays, but when that book was reprinted in 1996 the text was quietly dropped. For his part, Kolakowski never bothered to collect 'My Correct Views on Everything'. Now, after decades in the shadows, the debate between Thompson and Kolakowski has returned to print, and is enjoying at least a measure of attention. St Augustine's Press has made the reply to Thompson the title essay of a new collection of Kolakowski's writing about communism, religion, and 'various unpleasant dilemmas of our civilisation'. A couple of pages of Thompson's 'Open Letter' are included in the book, in a rather inadequate attempt to remind readers of the original context of 'My Correct Views on Everything'. In an article for a recent issue of the New York Review of Books, Tony Judt has excavated the Kolakowski-Thompson debate, and tried to connect it with wider discussions about the nature and future of Marxist theory and left politics. Norton has recently republished Kolakowski's Main Currents of Marxism, a long and hostile account of the development of Marxism, and Judt recommends this text as well as My Correct Views About Everything to his readers. Judt assures us that Main Currents of Marxism 'is the most important book on Marxism of the past half-century' and 'will surely not be superseded'. He repeats Kolakowski's explanation of Marxism as an mixture of 'Romantic illusion' and 'uncompromising historical determinism', seasoned with a whiff of pseudo-Christian apocalypticism. This odd brew has a tendency to upset the mental balance of intellectuals. Judt makes a great deal of the fact that Kolakowski undertook his intellectual apprenticeship in Poland, and suffered repression at the hands of that country's political and intellectual establishment in the decade after 1956. Kolakowski, we are assured, has first-hand experience of the consequences of Marx's malign doctrine, and is thus in a better position than privileged and protected Western intellectuals to appreciate the flaws in that doctrine. Kolakowski's exposure to 'actually existing socialism' did influence his understanding of Marxism, but not in the way that Judt imagines. Despite his political changes of heart, Kolakowski has never shaken off the habits of thought he learned from doctrinaire Stalinists in the frosty first decade of the Cold War. In his early twenties Kolakowski made a name for himself as the Communist Party's most energetic critic of Catholicism, that traditional enemy of the Polish left. The young Kolakowski's criticisms of the Catholic tradition betray the classical intellectual method of Stalinism. In essay after essay, Kolakowski essentialises a complex body of ideas, reducing it to a few crude formulations, links these formulations to discredited political positions, and gives the ideas a teleological quality, in an effort to undercut any future attempt to revise or otherwise rehabilitate them. Under the guise of intellectual history, the young Stalinist pursues the crudest political polemic. Worse than Kolakowski's misuse of Marx's ouevre is his misunderstanding of Marx's method. Kolakowski treats Marx as a curious cross between a second-rate bourgeois social scientist and a wild-eyed prophet. Marx's use of the dialectic is treated either as a rhetorical affectation or as evidence of an appetitie for feverish pseudo-Hegelian speculation about 'destiny'. Determined to ridicule his subject as a dogmatic false prophet, Kolakowski is incapable of appreciating the way that the dialectical method informed all of Marx's thinking, making his concepts nuanced and contextual and open to continual refinement. Marx had no time for the static categories of bourgeois economics, just as he had no time for the dogmatism inherent in all prophecy. All of Marx's concepts, even concepts as fundamental as 'proletariat' or 'capital', were dialectical abstractions, slices of an infinitely complex and continually changing reality. Kolakowski, though, insists on freezing the concepts of Marx and his followers, and treating them like the definitions of a dour analytic philosopher or number-crunching sociologist. Judt is oblivious to the weaknesses in Kolakowski's understanding of Marx and Marxism. Indeed, he repeats some of Kolakowski's most dubious arguments, insisting that 'neither Marx nor the theorists who followed him intended or anticipated' socialist revolution outside Western Europe, and characterising Lenin, that most voluntarist of all Marxists, as a crude fatalist who 'insisted upon the ineluctable necessity' of the triumph of Bolshevism. In a pompous, demagogic tone, with more than half an eye to his worshipful progressive audience, Thompson shook his rhetorical finger at the exiled Kolakowski, admonishing him for apostasy...How dare you, Thompson suggested from the safety of his leafy perch in middle England, betray us by letting your inconvenient experiences in Communist Poland obstruct the view of our common Marxist ideal? Judt calls Kolakowski's reply to Thompson 'the most perfectly executed intellectual demolition in the history of political argument'. No one who reads it 'will ever take Thompson seriously again'. The author of The Making of the English Working Class, veteran of the batte of Cassino, and leader of the international volunteer labour force that built a railway across the wilderness of post-war Bosnia stands exposed as a 'lazy' man 'untainted by real-world experience', who was interested in Marxism only because it 'made it possible for him to master all of history and economics without having to study either' and thus 'solve the problems of mankind in one stroke'. According to Judt, Thompson is not even interested in debating Kolakowski seriously - he is more interested in whitewashing the Soviet Union and its uncritical supporters than in dealing with the principled positions of the Polish critic of the New Left. I cannot fly. When you spread your wings and soar into the firmament where Kierkegaard and Husserl, Heidegger, Japsers and Sartre and the other great eagles soar, I remain on the ground like one of the last great bustards, awaiting the extinction of my species on the diminishing soil of an eroding idiom, craning my neck into the air, flapping my paltry wings. All around me my younger feathered cousins are managing mutations; they are turning into little eagles, and whirr! with a rush of wind they are off to Paris, to Rome, to California. Late in 1972 Thompson considered writing a critique of Tom Nairn, a key figure in Britain's New New Left, before settling on Kolakowski as a subject. By the beginning of 1973 Thompson had been dismayed the news that his old ally was busy organising the conference that would be held in April at Reading University under the title 'The Socialist Idea: a Reappraisal'. Writing to Saville in March, Thompson described Reading's Graduate School of Contemporary European Studies, which was co-hosting the conference with the publishing house Weidenfeld and Nicholson, as 'a horrific set of people'. Robert Cecil, the head of the School, was a 'NATO professor'. [T]he editorial bed of nails is more probing than usual...When I tell you Edward Thompson is writing an open letter to Leszek Kolakowski of which he has only done the first 20,000 words so far...you will understand the beginnings of our problems. Thompson's 'Open Letter' thus attempted to differentiate its author's beliefs from the Marxisms of the New New Left - Marxisms Thompson understood only imperfectly - as well as the Stalinism that had been rejected in 1956 and the anti-Marxism of Kolakowski and the NATO professors who gathered at Reading in April 1973. They regarded socialist humanism as obsolete, and EP Thompson as an obsessive individualist stuck in the past. To put it politely, the 'Open Letter to Leszek Kolakowski' bored them. It is clear that Tony Judt is guilty of distorting the meaning of Thompson's 'Open Letter to Leszek Kolakowski'. It is absurd to try to characterise the 'Open Letter' as a defence of Stalinism and the 'excesses' of left politics in the late 60s, written by a lazy and cloistered intellectual who wanted only to impress an adoring New Left audience. The 'Open Letter' is the work of a veteran Marxist and long-time critic of Stalinism who was concerned - perhaps overly concerned - to distance himself from the contemporary British left and from most contemporary Marxisms, as well as from the anti-Marxism Kolakowski had embraced by 1973. Writing for a large-circulation publication about an obscure and still mostly out of print text, Judt has failed to give his readers an accurate summary of Thompson's argument against Kolakowski, let alone an accurate account of the crcumstances surrounding the clash between the Polish philosopher and the English historian. Judt is a busy man: his articles for the New York Review of Books are squeezed out when he is not performing his duties as a senior academic at New York University. A charitable person might suggest that Judt did not have time to (re)read the 'Open Letter' before writing about it. Leszek Kolakowski, though, did not have the same excuse when he wrote 'My Correct Views on Everything'. Kolakowski had been acquainted with Thompson's writing for at least a decade, and had seen the 'Open Letter' even before it was published. Despite these advantages, Kolakowski also failed to engage with the substance of Thompson's arguments. Like Judt, he ignored Thompson's painstaking efforts to work out an original and nuanced notion of Marxism, and instead launched a series of attacks on Stalinism and on a parody of the New Left. 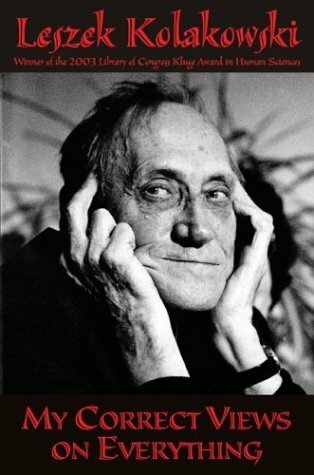 In the notes to The Poverty of Theory and Other Essays, Thompson would justly complain that Leszek Kolakowski's text 'did not engage with me'. The real reason for the failure of Judt and Kolakowski to deal with Thompson fairly is simple. Both men have an understanding of Marxism that is so simplistic that it cannot hope to accomodate the nuances of Thompson's thought, or the thought of most other important Marxist thinkers. Whatever other flaws it possesses, Thompson's pluralist, anti-essentialist notion of Marxism-as-tradition cannot be written off as a species of 'uncompromising historical determinism' or 'Romantic illusion'. Kolakowski and Judt must replace it with straw men, lest it undermine their own dogmatic 'explanations' of Marxism. The last part of Judt's piece highlights the poverty of his theory of Marxism. In a twenty-first century world of 'pre-emptive' wars and savage neo-liberalism disguised as 'globalisation', Judt fears that the 'moral appeal of some refurbished version of Marxism is likely to grow'. Considering Jacques Attali's fashionable new book on Marx, Judt complains that, 'since no one else seems to have anything very convincing to offer', a 'renewed faith in Marxism' is becoming the 'common currency of international protest movements'. For Judt this twenty-first century Marxism is simply a rehash of the creed Kolakowski denounces: with its 'fantasy' of revolutionary change it is no better than the neo-conservatism doctrine in favour in Washington. Kolakowski's reply to Thompson and his history of Marxism can be 'read with much profit' by liberals who want to lance the new Marxist boil. It seems to me that Kolakowski's reductionist and dogmatic view of Marxism has even less explanatory value today than it had thirty-three years ago. With the demise of the Soviet Union and the decline of its former satellite parties the forces calling themselves Marxist have become far more fragmented and diverse. Judt refers to the popularity of Marxism in Latin America, in the wake of the upsurge in social conflict there, but even in the Latin American countries that have moved farthest leftwards no brand of Marxism has achieved hegemony. In Venezuela and Bolivia, the most popular left ideology appears to be syncretic, blending elements of Guevaraism and Trotskyism with certain 'bourgeois nationalist' ideas and - in Bolivia at least -traditional indigenous beliefs. It would be quixotic indeed to make the 'Bolivarian socialism' espoused by Hugo Chavez's Fifth Republic Movement an epiphenomenon of What Is To Be Done? or Capital. Whatever flaws it has, Thompson's notion of Marxism-as-tradition seems better able to accomodate the diversity of 'actually exisiting socialism' in the first decade of the twenty-first century than the caricatures drawn by Judt and Kolakowski. Perhaps, though, some of the people who read Judt are less interested in explanatory power than rhetorical power. With its crude and fanatically held central tenets and promise of inevitable violence and tyranny, Judt's and Kolakowski's 'Marxism' can sit comfortably beside 'Islamofascism' and 'anti-globalisation Luddite' in the bestiary of imperialism's twenty-first century apologists. Kolakowski's writings may yet play a bit part in the 'war of ideas' George Bush has declared on the opponents of the 'free world' that My Correct Views on Everything spends so much time defending. *All of the correspondence quoted in this post comes from the Saville Papers in the archives of the Brynmor Jones library at the University of Hull. Less than week after the fifth anniversary of 9/11, the US looks set to release without trial a man who blew up a passenger airliner, killing seventy-three people. But hey, they don't count - they were commies, right? On the fifth anniversary of the beginning of the War of Terror, a leaked report has US military intelligence suggesting that Al Qaeda is now the most important political and military force in Iraq's largest province. 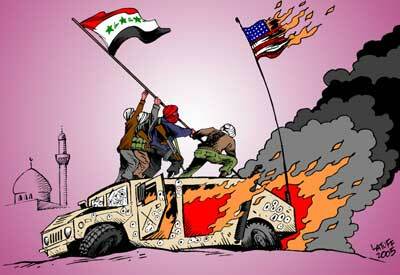 If the report being leaked is accurate, then the US has clearly suffered a massive defeat in al-Anbar province. After spending huge amounts of material and goodwill - in Iraq and internationally - trying to pacify the province with bullets and bombs, it has lost effective control of cities like Ramadi and Fallujah, as well as the region along Iraq's border with Syria. This set of facts throws down the gauntlet to the warmongers in Washington. Should an attempt be made to reconquer al-Anbar province - to repeat the attempts to pacify Fallujah on a larger canvas - or should the US effectively give up on the province? Either decision has awesome consequences. The massive military operation that would be required to retake the province, even if only temporarily, would provoke anger and protests, inside and outside Iraq, and also cost many US lives, at a time when public opinion is turning strongly against the war. On the other hand, simply giving up on Anbar would mean that the US accepted Al Qaeda and other virulently anti-US forces as de facto political players in Iraq - as forces that had to be included in negotiations about the future of the country. There is no point in keeping all those US troops there. They will just steadily be blown up or picked off. Hold provincial elections, hand the keys of the cities to the new govenors, and withdraw over the horizon. The Shiites and Kurds will have to reach an accommodation with them, and it would be all to the good if they knew that the Americans were no longer going to try to keep the Sunni Arabs down for them. In other words, divide and rule, or at least influence. The US approach seems so far to be to refrain from trying to recapture the whole of the province, but keep troops in a few 'islands' - Ramadi, and areas close to the Syrian border - so as to maintain some sort of illusion of control and avoid presenting a picture of humiliating withdrawal. As the year goes on, and the Republicans suffer heavy electoral defeats because of the endless wars in Iraq, Cole's more pragmatic brand of imperialism is likely to win many advocates in Washington. The real left has a very different take from Cole - it calls for immediate US withdrawal from all of Iraq, not just al-Anbar province. Here's a statement from the Worker-Communist Party of Iraq on the strike action Basra oil workers have been taking against the occupiers and their stooge government. Percutio, Bill Direen's heroic attempt to bridge the abyss between Continental European and Kiwi culture, is now available online here. The aim of Percutio is to publish work in its language of creation so that each contribution may gain meaning from and offer meaning to surrounding works--be they drawings, photo-essays, meditations, extracts from writing-in-progress, travel notes, transcriptions or poetry. This "trans-cultural" issue draws from the work of historians, poets, painters and researchers whom I have come across in New Zealand, Germany and France. Where space has allowed, translations accompany the original texts. The pen had lost its firepower. but its surface is smooth. La plume perd de son pouvoir. et de son enfant. Le sang a coule/ et s'est fige/. Que naisse un nuage de mouches. bien que la surface en soit plane. mais les papiers circulent encore. *Emble\me de l'e/glise fonde/e par Te Kooti. The poem refers to Te Kooti Te Turuki Arikirangi, the Maori resistance fighter and religious leader who escaped from imprisonment on the Chatham Islands in 1868 and shortly afterwards launched a devastating attack on the settlement of Matawhero, near present-day Gisborne on the East Coast of the North Island of New Zealand. 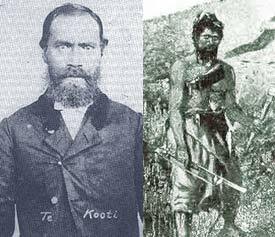 The attack marked the real beginning of a four-year guerilla war which ended when Te Kooti and a small band of exhausted followers were forced to take refuge in the independent Maori state in the King Country region of the North Island. After making peace with the government in Wellington Te Kooti built his Ringatu Church, which reinterpreted the Bible in the light of his own experiences (Te Kooti's escape from the Chathams was likened to the crossing of the Red Sea, and his guerilla war was compared to Jesus' forty days in the wilderness). The Ringatu - the word means 'upraised hand' - doctrine still has thousands of adherants in the eastern Bay of Plenty and on the East Coast. How much of that information gets into my poem, let alone its French incarnation, I'm not sure! I think a lot of people would wonder about the wisdom of a Pakeha like myself writing about Te Kooti, let alone another group of whiteys putting the poem into French. In my defence I'd guess I'd say that my poem is written from 'outside', not inside - from the perspective of a mystified Pakeha observer of Te Kooti's war. The title of the poem is supposed to signal this distance, echoing as it does the headlines Pakeha newspapers carried after Te Kooti's attack on Matawhero. 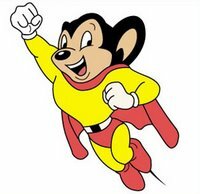 My old and intractable enemy, Anony Mouse, has reappeared, this time to pour scorn on the idea that Allen Curnow is worthy of favourable mention on such a politically principled blog as this one. I can't believe you're highlighting Allen Curnow, who was a conservative old fogey who never did aything for the left. C'mon, Maps, or whatever you call yourself, leftists whould support writers who write about and participate in the struggle, not ivory tower intellectuals who refuse to take a position on the burning questions of our day. Your attitude is anti-Marxist. Sharpen up. The more the opinions of the author remain hidden, the better for the work of art. the realism I allude to may crop out even in spite of the author’s opinions. Let me refer to an example. Balzac whom I consider a far greater master of realism than all the Zolas passés, présents et a venir [past, present and future], in “La Comédie humaine” gives us a most wonderfully realistic history of French ‘Society’, especially of le monde parisien [the Parisian social world], describing, chronicle-fashion, almost year by year from 1816 to 1848 the progressive inroads of the rising bourgeoisie upon the society of nobles, that reconstituted itself after 1815 and that set up again, as far as it could, the standard of la viellie politesse française [French refinement]. He describes how the last remnants of this, to him, model society gradually succumbed before the intrusion of the vulgar monied upstart, or were corrupted by him; how the grand dame whose conjugal infidelities were but a mode of asserting herself in perfect accordance with the way she had been disposed of in marriage, gave way to the bourgeoisie, who horned her husband for cash or cashmere; and around this central picture he groups a complete history of French Society from which, even in economic details (for instance the rearrangement of real and personal property after the Revolution) I have learned more than from all the professed historians, economists, and statisticians of the period together. Well, Balzac was politically a Legitimist; his great work is a constant elegy on the inevitable decay of good society, his sympathies are all with the class doomed to extinction. But for all that his satire is never keener, his irony never bitterer, than when he sets in motion the very men and women with whom he sympathizes most deeply - the nobles. And the only men of whom he always speaks with undisguised admiration, are his bitterest political antagonists, the republican heroes of the Cloître Saint-Méry, the men, who at that time (1830-6) were indeed the representatives of the popular masses. That Balzac thus was compelled to go against his own class sympathies and political prejudices, that he saw the necessity of the downfall of his favourite nobles, and described them as people deserving no better fate; and that he saw the real men of the future where, for the time being, they alone were to be found - that I consider one of the greatest triumphs of Realism, and one of the grandest features in old Balzac. That's the message you get if you type the name of the man one well-lubricated pundit called 'New Zealand literature's fastest-rising star' into the search engine of the beguiling but shamefully incomplete literature map website. I did manage to get an intriguing result (Kierkegaard as a soulmate?!?) for John Ashbery, who has his nose in front in this blog's greatest living writer poll. Come to think of it, has anyone noticed the physical similarities between Jack and John? The trouble with open publishing is that it sometimes means publishing stuff like this. 1. Will you be good Popperians and submit yourselves to the falsification test over this prediction? I mean, if the world doesn't go up in smoke on the 12th, will you drop the whole Sky God thing and do something more useful with your brains, or will (as I fear) apocalypse and His Second Coming merely be rescheduled? 2. Which 12th of September are you talking about? After all, New Zealand - or more precisely the Chatham Islands, which not everybody considers a part of New Zealand - leads the world in time, so any apocalypse which begins in the Middle East or America on the 12th is likely to come on the 13th day of our month. This is the only documentary to explore Curnow's remarkable life and work. It's a compelling, close-up portrait of a man who worked on the cutting edge of literature for nearly 70 years. Beautifully filmed, with music by Jonathan Besser and Douglas Lilburn, the film takes him to the scenes of may of his most important poems - from New Zealand's South Island landscapes and Auckland’s West Coast beaches to the streets of Rome. 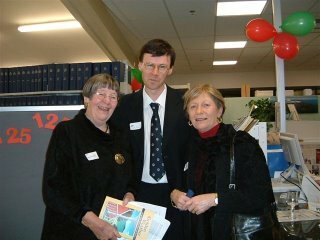 I remember seeing a very sprightly ninety year-old Allen Curnow at the premier of Early Days Yet in the winter of 2001, and being surprised when the great man died suddenly only a few weeks later, in the middle of September, when the world was preoccupied with Osama bin Laden's attack on the United States. Its author may have lived only a few days into the 'age of assymetric warfare', but 'Moro Assassinto' tells us more about terrorism than a thousand columns by Christopher Hitchens or Thomas Friedman. 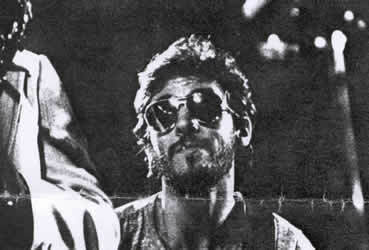 Read it, and watch Shirley Horrocks' documentary tomorrow night. then buy after receiving the pittance which is afforded writers (and not only in NZ, in France and UK also) for your words. I assume you need to buy ink or pens with equal frequency as beer, and wonder if it is not a long way to walk in our self-perception (or the perception we have that links writing with either drinking or with materials) to , in our mind's eye, link the pittance with materials. Just a thought, from one missing the occasional glass, but using more of the ink! Wayne Mapp must feel like a dog that's been thrown two bones. Wayne's been getting his teeth sunk into Steve Maharey, the Blairite Minister and former radical sociologist who back in the 90s was known to buy the odd guilt copy of Socialist Worker, and who now seems to have been guilt-tripped by his local Labour branch into giving $200 to striking supermarket workers. 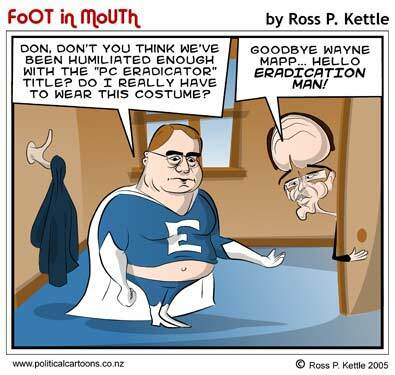 If Wayne bothers to read the text of Hone Harawira's recent speech to parliament about the cleaning industry, though, he'll find a lot more to bite at. Unlike Maharey, who's far too polite to actually support a strike in public, Hone has come out explicitly for the Service and Food Worker cleaners who have been campaigning for better pay and conditions this year. to see him talking about our campaign! These people may look like supermarket workers from south Auckland, employed on less than $12 an hour, seeking a long overdue pay rise, but in the topsy-turvy world of PR suits they're actually rapacious union thugs, holding their poor employers to ransom and threatening us all with a future where cucumbers and onions are more expensive than petrol. Ho hum. I was wondering, though: is this a form letter? Anyone else received it? Sent: Saturday, 2 September 2006 4:49 p.m.
refuse to agree to the just demands of the National Distribution Union. paid to all of our staff. what is in the best interests of our customers, staff and the business. Update: a new and rather arrogant blogger calling him/herself Connectivity Bridges (damn hippies!) has a post up about Steve 'Third Way' Maharey's princely donation to the strikers.